The use of other companies’ trademarks in your Adwords campaigns is something that crops up from time to time. After a recent judgement by Niilo Jääskinen, the Advocate General of the European Court of Justice, it appears that the rules of the game are about to change (probably in the Summer of 2011). What can we do in Adwords? Currently you’re able to use someone else’s trademark as a keyword (or phrase) to trigger an ad. You are not allowed to use their trademark in the body of your ad. This seems to be sensible. You can advertise your alternative against a competitor or the market leader but you can’t mention them in the ad. So, an ad triggered by the phrase “best hoover” can display an ad containing words to the effect “Our vacuum cleaners don’t clog up. Buy a Dyson”. In addition you can not show their URL at the bottom of the ad. I can’t think of a situation where the average user ,or indeed a “moron in a hurry“, can be confused by ads adhering to the current Adwords policy (please respond below if you disagree). Are there implications for Google’s system? By default the Adwords system is designed to match ads with keywords in a broad way. Ads will display against keywords and phrases that the system believes hold similar meaning. So, even when an advertiser adheres to a new law, they could potentially display an ad against a competitor’s trademark without specifically targeting that term. 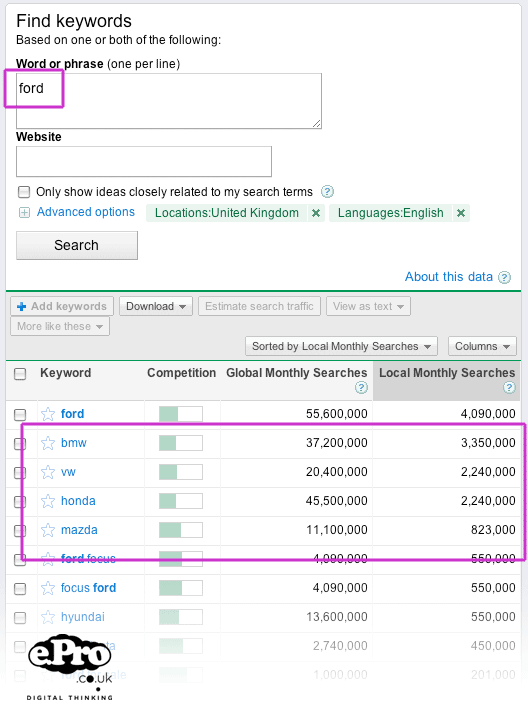 The following grab from the Google Keyword research tool seems to add weight to the idea that this is the case. I wonder whether, since in its current form the use of the trademark is ‘behind the scenes’ and never seen by the user, Google’s use of trademarks in a database record somewhere to suggest that ‘ford’ is ‘similar to ‘vw’ against the likely trademark ruling? If so, this is surely absurd. Perhaps we’ll all have to add our competitors as negative keywords just to be on the safe side? Is online so different from the real world? The argument that I hear is that it’s not right for a business to profit from another’s trademark. Fair enough. How different is this from the scenario in the high street when Marks and Spencer opens a new shop? Other traders know that M&S will attract footfall in the same way that terms attract search traffic on Google. If the neighbouring traders can provide a compelling offer, they may be able to win some of that business that was M&S bound. No one’s been misled and I see nothing wrong. Surely, clearly written ‘competitive’ Adwords ads aren’t too different from that. If you’re looking for some help setting up or optimising your Adwords and PPC campaigns, please get in touch, I’d love to help.